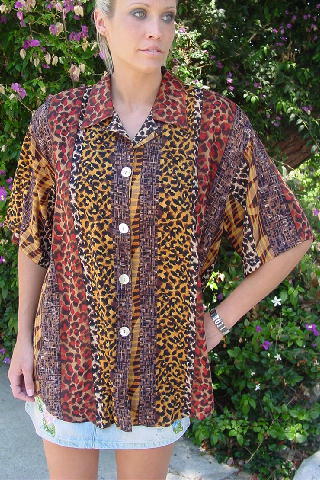 This 100% rayon short sleeve blouse is by Impressions of California. It has four pearlized abalone buttons down the front and a small dark brown button under the left collar. There are shoulder pads and rounded shirttails. It has vertical wide and narrow stripes in various animal prints, a freeform box design, and a wavy lines design. It's in antique white, pale sandy-pumpkin, dark red-rust, black, yellow, and sand. 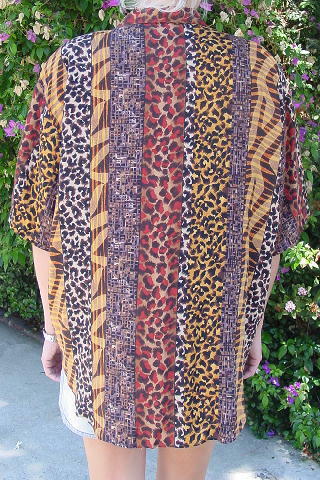 shoulder to bottom side hem 25"
shoulder to bottom front hem 30"